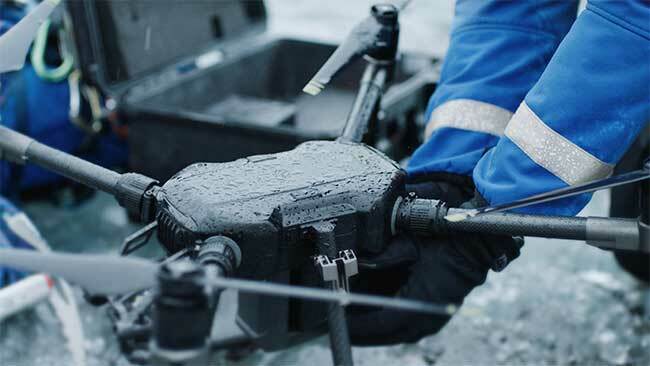 The DJI Matrice 200 quadcopter is an economical single-gimbal drone for industrial and first-responder applications. It is powerful, maneuverable and adaptable to a broad range of uses. It ships only with a built-in First Person View camera that’s used strictly for navigation. Since the Matrice 200 is shipped without a recording camera, you can equip your drone with a camera that best suits your needs. And since compatible gimbal-mounted cameras are removable, you can get more than one camera, if that’s what your industry requires. Shoot with one camera — perhaps a thermal-imaging camera. Then remove it, mount a high-definition video/still camera, and shoot with that. Switch back when you want. Choose the camera that works best for firefighting, law enforcement, security, precision agriculture, engineering, construction site mapping, or utilities or infrastructure inspections. Options include cameras that shoot thermal images, a camera with an action-freezing leaf shutter, a camera with a powerful zoom lens, and a camera that accepts interchangeable lenses, two of them zoom lenses. The Matrice 200 remote controller’s signals extend 4.3 miles. An available FPVLR range extender can increase that up to 3x. Commercial Drones recommends professional installation by its trained technicians unless you have experience installing antenna hardware and firmware. Commercial Drones installation is fast and economical, involving the shipment of the remote controller only. Optional is the use of dual remote controllers in a master-slave arrangement. The pilot controls the drone on the master, and the camera operator controls camera movement and video/still recording on the slave. This allows for more detailed data collection during inspections. Additional remote controllers< are available from Commercial Drones. Matrice runs on twin batteries. TB50 batteries, at 4280 mAh, are standard. For longer flight time, there are , at 7760mAh. Matrice 200 batteries must be charged to within 13 percent of each other or takeoff is blocked. If one battery fails during flight, the pilot receives a warning and should land the drone. The batteries are self-heated, allowing flight in freezing temperatures. Insulation stickers are included. XT — With thermal imaging by FLIR, the Zenmuse XT camera reveals heat sources, including at night. Available in four fixed-lens options. Imaging at 640/30fps or 336/30fps, depending on model. 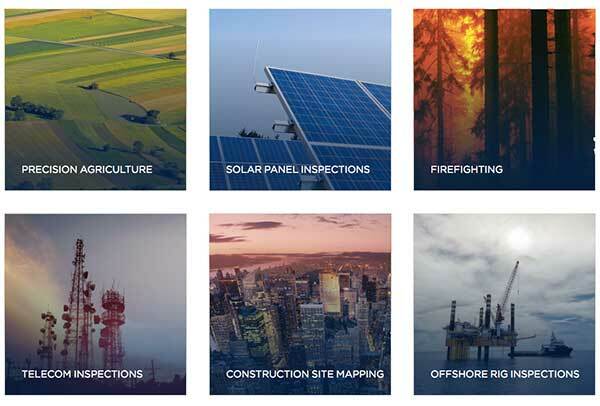 Best uses: Electrical tower inspections, solar panel inspections, search and rescue, firefighting, precision agriculture. Z30 — How close a view do you want, and from how far away? The Zenmuse Z30 has a fixed lens that zooms up to 30x, with 6x distortion-free digital zoom, for a maximum 180x magnification. Best uses: Cell tower inspection, wind turbine inspection, firefighting. X4S — Detailed images are captured by a huge 1-inch sensor on the Zenmuse X4S Its leaf shutter eliminates rolling distortion to capture fast action with a 24mm-equivalent lens. The X4S records 4K video at 6 fps in H.265 for superior slow motion, or 4K at 30 fps in H.264. Transfer rate is 100mbps. Stills are 20MP shot in bursts up to 14fps. It has fast autofocus. Best uses: High-quality aerial video and stills, including for mapmaking. X5S — With a range of interchangeable lenses and two zoom lenses, the Zenmuse X5S allows you to select the focal lengths that are ideal for your needs. Video is recorded in 5.2K or 4K. Stills are recorded in 20.89MP and shot in bursts up to 20fps. Aperture and shutter control is automatic or manual. Best uses: High-quality aerial video and still photography, including mapmaking. Firefighting: A Matrice mounted with a Zenmuse XT, an infrared camera that records thermal images, can detect heat sources, making it a lifesaving tool for firefighters. A Matrice so equipped can hover over a fire scene and reveal fire in walls and roofs. That helps firefighters know where to attack the blaze, step on a roof safely, and vent smoke. It also can spot hotspots that need further attention. Search-and-rescue: An XT-equipped Matrice can scan snow from an avalanche, or the rubble left by an earthquake, fierce storm, explosion or terrorist attack for heat sources that may indicate buried survivors. It can also detect victims of a derailment or air crash who might have taken shelter in dense woods. Police: Surveillance is conducted away from the subject, with automatic tracking of the subject as he moves. Close-up evidentiary and identification photos can be taken with zoom lenses. Security: Thermal imaging can spot intruders hiding inside or outside buildings, and escapees hiding in dense foliage. Dogs may pick up the scent, but the Matrice can determine how far away escapees are, and it may capture images that show whether or not they are armed. The Matrice can patrol a sprawling roof, and it can monitor a perimeter day or night faster than a team in a vehicle or on foot. It also can view large areas that may mandate a tall view, such as a freight yard or prison yard. Utility Inspections: A thermal-imaging Matrice can spot leaks in solar panels, pipelines (even if buried) and high-tension lines. Mount a thermal camera or video/still camera consecutively on a Matrice 200 to provide detailed looks at hard-to-reach locations, such as the tops of wind turbines and towers. Telecom inspections: Inspect cell towers and relay stations without the need to endanger inspectors, who remain on the ground. Images can be shared simultaneously and recorded for later study. 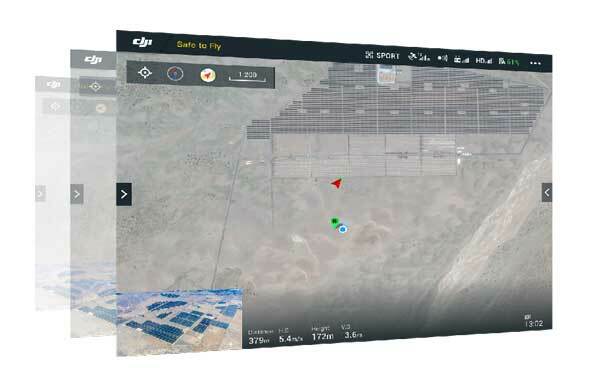 Construction: Use the Matrice in most phases, beginning with aerial imaging and data gathering for making site and topographical maps, and for building 2D and 3D models. Inspections of tall structures become easier, faster and safer, and aerial photos detailing progress can be shared with regulators, decision-makers and shareholders. Infrastructure inspections: The Matrice 200 speeds inspection of widespread networks of catenary lines for trolleys and trains. The upper stories of tall buildings, bridges, overpasses, roofs and other hard-to-access areas are more easily viewed with a zoom lens. Agriculture: With a thermal camera-equipped Matrice 200 and a subscription to an online analytical service, farmers can map crops faster than from roads or fields. They can use the data collected to determine crop choices, seed selection, irrigation, planting sequences, the presence of diseases and treatment, and potential yields. Mining: Aerial imaging and data collection can be used for highly accurate surveys and for building maps and 2D and 3D models. The Matrice can view hazardous and poorly accessed spots, such as high walls and muck piles. The Matrice also can be flown visually indoors, even underground. The M200 Series drones fold down in a snap and unfold just as quickly. Gimbal mounting plates and aircraft arms stay mounted during transportation so that you’re ready to fly within minutes. More information about the M200’s applications can be found at www.dji.com/matrice-200-series/applications . This page will be updated as case studies are created. What’s in the box? Matrice 200 body with folding arms; 1 pair landing gear; remote controller; 4 pairs of propeller (2 spares); 2 TB50 Intelligent Flight Batteries; 4 battery insulation stickers; battery charger; charging hub; power cable; USB cables with double a ports; 16GB microSD card; vision system calibration plate; 3 gimbal dampers; propeller mounting plate; and a carrying case. Is the Matrice 200 difficult to set up? No. It takes about four minutes to be flight ready. Only minor non-soldered assembly is required. The arms unfold and lock into place. The four props, two landing gear and dual Intelligent Flight Batteries must be snapped into place. Is the Matrice 200 difficult to store and transport? No. The arms fold into a much more compact form than when they are extended for flight. The Matrice 200 comes with a hard case for storage and transport. What can the case hold? Your Matrice 200 and enough for a prolonged remote shoot: 6 TB50 or TB55 batteries, 2 gimbals, 2 sets of propellers, one controller, 1 charger, 1 charger hub, and a CrystalSky tablet or Apple iPad. What is the maximum flight time of the Matrice 200? Maximum with two optional TB55 batteries is 38 minutes. Maximum flight time with the standard TB50 batteries is about 27 minutes. Depending on the camera chosen and flight conditions, both will be a few minutes shorter. What is the top speed of the Matrice 200? 51.4 mph. What is the range of the Matrice 200? 4.3 miles. Does the Matrice 200 come with a standard camera? It comes only with an FPV camera for navigation. A wide range of recording cameras is available. Which cameras are compatible with the Matrice 200? Cameras compatible with the Matrice 200 are the Zenmuse X4S, Zenmuse X5S, and Zenmuse Z30, plus the Zenmuse XT with an adaptor. Do any of the cameras accept interchangeable lenses? Yes. The Zenmuse X5S is a micro 4/3 camera that accepts interchangeable lenses, including two zoom lenses. The X5S delivers the highest image quality among cameras available for the Matrice 200. Do any of the cameras have zoom lenses? Yes. The Zenmuse Z30 has a 30x optical zoom lens that is fixed to the camera, and a 6x digital zoom, for a dramatic total of 180x magnification. It allows the operator to zoom in on difficult-to-reach spots during inspections for close-up 20 MP color stills. It also avoids signal interference by flying farther from metal structures while still enabling close-up views. The Zenmuse X5S, a micro 4/3 camera that delivers the highest image quality, accepts interchangeable lenses, two of them zoom lenses. Can the Matrice 200 be mounted with an infrared camera? Yes. The available Zenmuse XT is a FLIR thermal-imaging camera. It is available in two versions and several focal lengths. Can the Matrice 200 record thermal images and 4K video simultaneously? No, but it can do so separately if the cameras are swapped out. Switching cameras takes about a minute. To mount two cameras simultaneously requires moving up to the Matrice 210. Can the Matrice 200 accept an upward-facing payload? No. That would require moving up to a Matrice 210 model. What does the DJI AirSense system do? 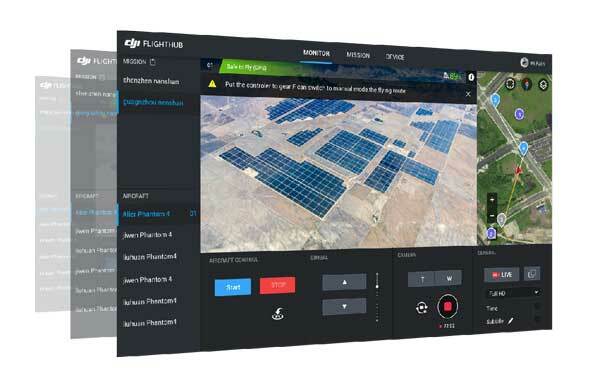 AirSense has an ADS-B receiver, which picks up signals from manned aircraft equipped with ADS-B transmitters, alerting the Matrice 210 operator and making flight safer. Why are they called Intelligent Flight Batteries? They really are smart. The batteries won’t allow takeoff unless they are charged to within 13 percent of each other. They warn when battery power is low and you must return home. They also warn when just one battery runs low or loses power, requiring an unscheduled landing. Which batteries are available for the Matrice 200? The standard battery is the TB50, with 4280 mAh of power, and the optional TB55 batteries are rated at 7660 mAh. Can I transport the batteries on an airliner? Airlines generally allow the TB50 batteries, but it’s best to check in advance. The batteries should be charged to no more than 30 percent. How does the Matrice 200 track a subject and/or keep a subject in the frame? 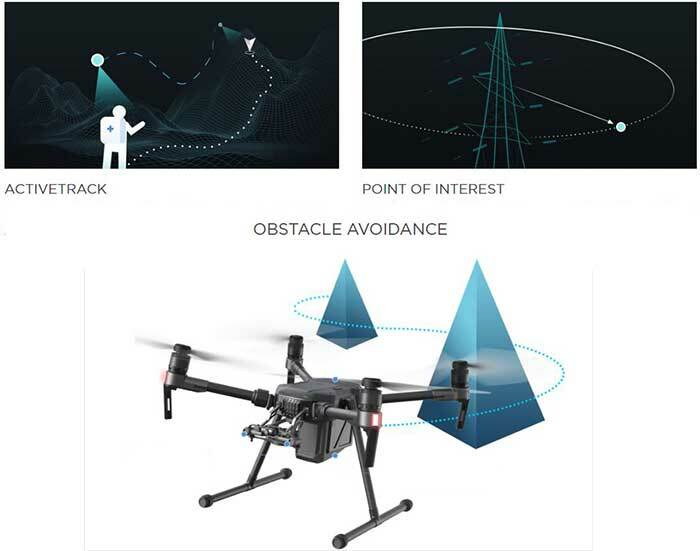 Four ways: ActiveTrack, which locks on a moving subject and follows; Spotlight, which keeps a stationary subject in frame and in focus while you fly in any direction; Point of Interest, which allows the drone to circle the subject; and Tripod, which allows the photographer to precisely place the subject in the frame and position the camera in close environments. Is the Matrice 210 equipped with GPS for positioning? Yes. Can I manually position the Matrice 200 for indoor flight? Yes, by using the seven positioning sensors. Forward obstacle sensing is 6 feet. Overhead obstacle sensing is up to 96 feet. How do I see what the drone’s camera sees? The Matrice 200 beams live video to your smart phone or tablet, once either is connected to your remote controller. The view is that of the built-in First Person View camera used for navigating. You can toggle to the mounted recording camera’s view using the remote controller. Is the 16GB capacity of the included microSD card the maximum storage for the Matrice 200? You can insert a card up to 128GB. What is the definition of Matrice 200 video? Depending on the camera chosen, it can record either high-definition 4K video (X4S or Z30 camera) or ultra-high-definition 5.2K video (X5S camera). What is the resolution of Matrice 200 stills? The highest resolution is 20.8MP with an X5S camera. Stills shot with an X4S are 20MP, with no rolling distortion, since it has a leaf shutter. Is landing difficult? The Matrice 200 has a downward-facing vision system that contributes to smooth landings. Can two controllers be used? Yes, an optional additional remote controller can be used in a master-slave arrangement: The pilot uses the master to control the drone, and the videographer/photographer uses the slave to control the cameras.